Last February 1, Ponggo & I, together with my sister attended the Graphika Manila 2014 and each time, we always come home refreshed and inspired with all the new lessons that we’ve learned from designers. 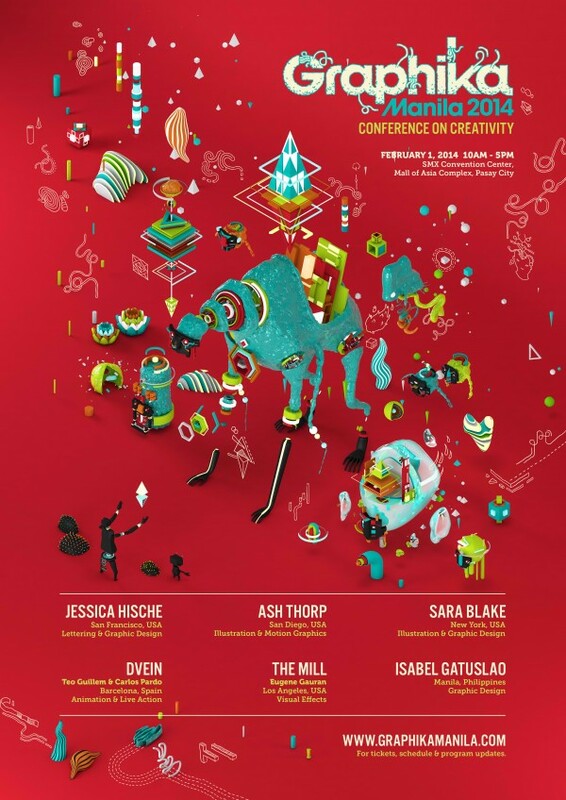 Graphika Manila is a yearly design convention. As much as it is a “conference on creativity” where design processes are being discussed, I can’t help but think that the tips that are being imparted by the artists can also be applied to life in general. We jotted down some notes for ya (as well as live tweeted as much as we can–check out #GM2014 on Twitter) because there’s just a looooot to be learned! That just probably answers all my life-long question about whether or not I should change my style. However, no matter what I do, even if I start with black & white, I end up coloring things in! Isabel was asked by Nike to design a shoe for Lebron James and even though she has never designed a pair of rubber shoes, she ended up sticking to her own black & white, clean & minimalist style and finally got to meet the basketball player himself. I guess it’s the same thing in life. If you’re too indecisive then you might already be eating up the time you should be spending on honing your craft. 3. Jessica Hische – If by any chance, you bump into those wonderfully lettered colorful covers with nothing but capital letters of Penguin books in your favorite bookstores, those are the works of Jessica Hische. I was checking online whether I should attend Graphika Manila this year. Her work was the first one that popped on my screen & I ended up buying the tickets right away 🙂 Hehe. 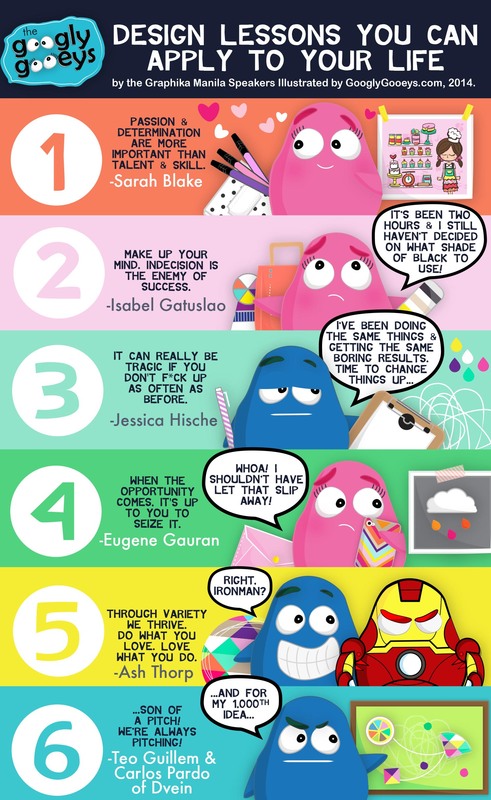 “Your sketches are sh*tty; they’re supposed to be”. “It can really get tragic if you don’t get f*ck up as often as before”. If your drawing style, schedule, life (or even life life ❤) is getting more and more predictable, then, it just means it’s time to explore new things and change your routine! “When the opportunity comes, it’s up to you to seize it”. I think the other thing that’s also important here is that whatever field you’re pursuing, it’s always important to open your eyes to and be able to identify something as an opportunity! I guess in the end there’s just a healthy amount of being humble enough so as to cater to the client’s needs and gauging when it is healthy to say no. Years ago, I felt like I was in the business of selling sleep, weekends, holidays & my sanity. I ended up changing my design path because I no longer wanted to compromise time for the people I love and it always helps when someone else affirms those thoughts! They said they’ve always been pitching ideas for clients they might as well be called that. This is how I actually feel about this blog and other works that I end up submitting allover the world wide web. I might not have been able to catch that “Son of a Pitch” tee but it’s a good reminder that we should think like entrepreneurs, always exploring new things and risking something a little (i.e. time & talent and probably investment) with nothing but faith and a good sense that a certain idea will work. You know what? I can go on and on talking about the things we’ve learned from Graphika Manila (and I might have just stated the obvious) but I strongly suggest that you visit each of the artists’ folios, ponder a bit on a quote or two and of course attend Graphika Manila next year! For the past couple of years, it is usually held during the first two months of the year.